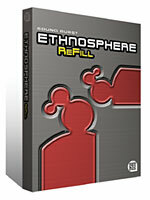 Ethnosphere Refill lets you create great sound with more flexibility than ever before, adding fresh soundbanks to the existing internal library of the Ethnosphere Ethnic Sound Module. Select from 280 mega-loops sampled from all-new instruments including toms, frame drums, fiber drums, talkinâ drum, udu drums and djembe; multi-layered single hits of toms and bongos; ultra-detailed xylophones, shakers, tambourines, wood blocks and cymbals, shining wind chimes, crisp rain makers, breath-taking guitars, mandolins, banjos and much, much more. Each sample was created using a top of the line Neve VR Legend to guarantee uncompromised quality, making Ethnosphere ReFill the perfect addition to your collection of ethnic instruments.. Listen to the MP3 files to get a taste of what this product can do for you.